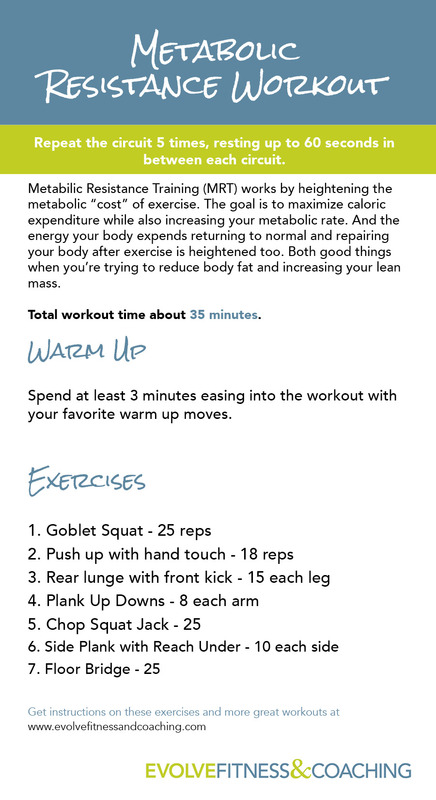 If you’re short on time but still want to fit in an effective training session—especially if your goal is fat loss—metabolic resistance training (MRT) is tough to beat. With this training style, the goal is to maximize caloric expenditure while also increasing your metabolic rate. MRT works by heightening the metabolic “cost” of exercise. And the energy your body expends returning to normal and repairing your body after exercise is heightened too. Both good things when you’re trying to reduce body fat and increasing your lean mass. MRT workouts can involve supersets, circuits, low rest periods between exercises and compound movements that involve more than one muscle group. It almost always packs a double-punch of aerobic and anaerobic work, breaking down the barriers between traditional weight training and cardio training. Try it with this circuit-based workout using multiple sets with very short rest periods in between. Perform the first exercise at the number of reps listed, rest for 15 seconds, then repeat that exercise five more times, always resting 15 seconds in between. Continue with the next exercise until you’ve done each one six times. It should take you about 35 minutes to complete the workout, including your warm up. Remember, you can decrease the number of times you repeat the exercise or increase the rest periods between each exercise if you need to modify the workout for your level. See the instructions on how to complete each move below. Download a PDF copy of the workout. Stand with feet shoulder-width apart, toes turned slightly out and hold a fairly heavy dumb bell with both hands in front of your chest, elbows pointing down. Squat deeply, knees out over your feet, and stand up. Repeat. Get into a full plank position, feet about shoulder width apart or slightly wider for leverage. Hands should be directly under your shoulders. Lower down into your push up, and after you push your body away from the ground, lift your right hand to tap your left shoulder. Put your arm back down and do a push-up. Then lift your left hand to tap your right shoulder. Stand tall and take a controlled lunge (or large step) backward with your right foot. Lower your hips so that your left thigh (front leg) becomes parallel to the floor and your left knee is positioned directly over your ankle. Keep your right knee bent at a 90-degree angle and pointing toward the floor. Your right heel should be lifted. Push back up to starting position and kick the rear leg out in front of you. Without pausing, step back into another lunge and repeat. Starting on your elbows and toes (or on your knees if you need to modify), engage your core before you start. Keep your hips as still as possible, push up with one hand then the other until you are propped up in a push-up position. Lower back down to your elbows one arm at a time. Halfway through, change your leading arm so you strengthen the other shoulder as you press up to your hands. The goal is to maintain a solid plank position throughout the whole exercise and to not let your hips sway. For maximum benefits do it in a steady rhythm that pays total attention to form: body straight, lower abs pulled in. Raise your arms overhead, palms together. Jump your feet out to the side to start the jumping jack, sinking down into a squat, chopping your hands down at the same time. Return to start and repeat. Lift your body into a side plank, and start with your right arm raise straight above you so that it’s perpendicular to the floor. Keep your abs braced and rotate your torso to the right to reach under and behind your torso with your right hand, then lift your arm back up to the starting position. Modify this exercise by keeping your knee on the ground, and raising your hip up. Get more great workouts like this one.